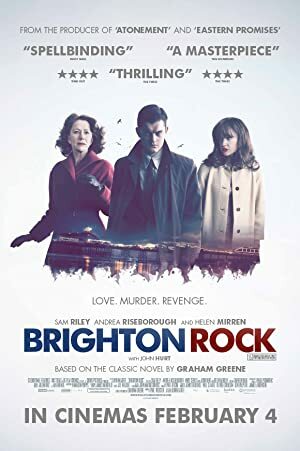 Brighton Rock (2010) – What's New on Netflix Canada Today! Whilst Mods and Rockers fight on the Brighton beaches in 1964, Pinkie Brown, member of Spicer’s protection racket gang, aims to wipe out his boss and take over the town from rival mobster Colleoni. Prior to the murder of Fred, one of Colleoni’s men, naive waitress Rose Wilson had been on the pier and inadvertently photographed with Fred. Pinkie feigns courtship and marries Rose to keep her quiet but Ida, Rose’s employer and a friend of Fred, has her suspicions and makes it her business to save Rose from Pinkie’s clutches. An adaptation of Graham Greene’s classic novel about a small-town hood who marries a waitress who witnessed him murdering a rival thug in order to keep her quiet. As his gang begins to doubt his abilities, the man becomes more desperate and violent.